It's a fixture for the many tourists visiting NYC: If you're willing to stand in line for a few hours at the TKTS booth in Times Square, you can get last-minute tickets to Broadway shows at an affordable rate. A design competition to rejigger the booth was held way back in 1999 and the winning design, from Australia, is only now being built. Glass panels and beams fabricated in Austria are finally being packed for shipment to New York to construct what Tim Tompkins, president of the Times Square Alliance, describes as "the Spanish Steps on steroids" a glowing, red-glass 27-step staircase that, as one British engineer boasted, will be able to accommodate 1,500 "fat Americans." 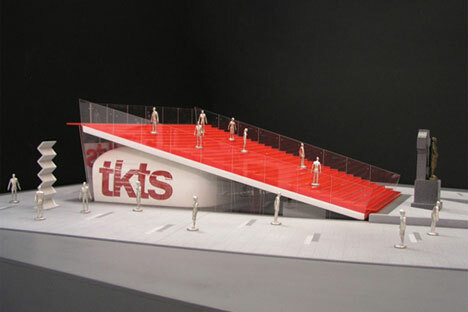 We're guessing the competition's losing designs had thin balsa steps, which would have fat Americans crashing into the booth below, squashing unlucky TKTS sellers.